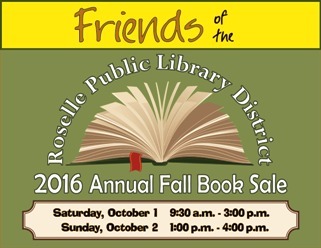 Don't miss the Friends of the Roselle Library annual Fall Book Sale this weekend! Stop by the Library tomorrow, Saturday, October 1, 9:30 a.m.-3:00 p.m., or Sunday, October 2, 1:00-4:00 p.m. When you support the Friends of the Library, you help provide funds for Grandparents Got Game!, Summer Reading Programs for all ages and a variety of other programs. The Library is located at 40 South Park Street, Roselle. Call 630-529-1641 for more information. There's something for everyone at the Fall Book Sale! What treasures will you find?